Seems like most of information related to using hand planes today tends to lean toward the puritanical. The vast majority of instructional material is written for those planing rough boards straight from a sawmill. Certainly, there is a good deal of logic behind this. After all, hand tool purists prepare their wood from the roughest of cuts, be it from saw or froe. For them, the three bench plane model makes complete sense. That said, there are an awful lot of folks out there in the midst of transitioning from powered to hand tools, and many more who, while using hand tools to some degree of exclusivity, work primarily with dimensional lumber due to constraints of time and available space. In some cases, a project may include a combination of both. 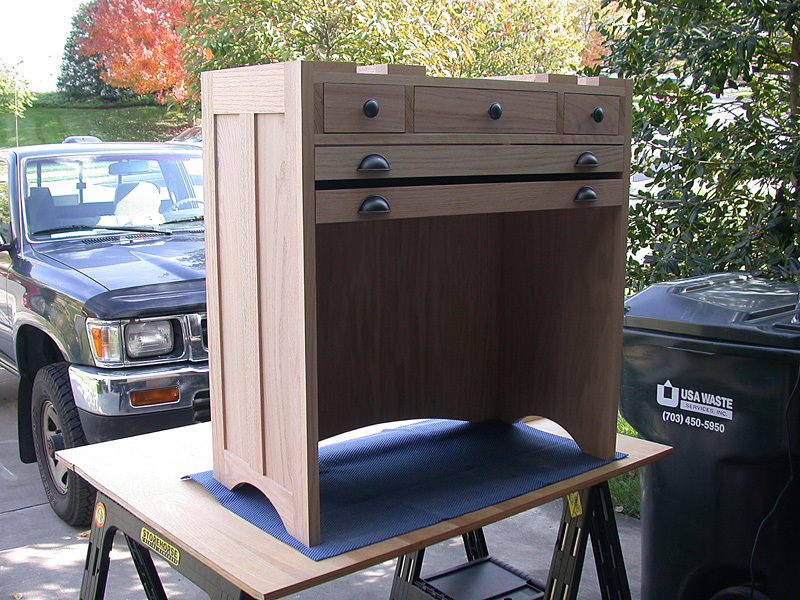 I often use dimensional lumber for drawer carcasses for example, in order to save time. The fact is that working rough lumber is not always practical. I know men and women who are passionate about their craft, but have to move the car out of the garage just to get to the saw horses they use as a bench platform. Taking a momentary step back, the traditional three bench plane system consists of a Fore Plane, Try Plane, and Smoothing Plane. Used in sequential steps of coarse, medium, and fine, you can take just about any slab of tree and turn it into a finished board. Yet while that works perfectly for woodworkers preparing rough cut wood straight from the tree or mill, it doesn’t make much sense for those using dimensional lumber. Dimensional lumber, of course, is the pre-surfaced wood you find at your local home center, etc. 1x2s, 2x4s and the like are all dimensional lumber. The wood has been processed through commercial planer and jointer machinery to make it a consistent and standardized size. And while it’s far more expensive than unprepared wood, it’s often more practical for small singular projects or when wood storage is simply not an option. I will confess right now to using dimensional lumber for many of my own smaller projects. Even though dimensional lumber is pre-surfaced, it still requires some degree of final finishing. Further, the wood still needs to be cut, trimmed, jointed, etc., in order to construct whatever it is you’re working on. I use my hand planes, hand saws, brace, and chisels to do as much of work as possible, but the workflow tends to be a little different than when I’m preparing rough lumber. With dimensional lumber, there’s really no need for the coarse step of flattening with a no. 5 fore plane. For most smaller surfaces that have not been edge joined (panels and tops), a quick pass with a very finely set smoothing plane, card scraper, or scraper plane is usually all that is required. For glue ups, I use my no.7 try plane with a straight beveled (no camber) iron to prepare the edges to be joined. I also use my no. 7 with a slightly cambered iron to level out uneven joints before moving to the smooth plane. Again, a very fine set is all that is needed. For everything else, the same rules apply as when working rough lumber. For the occasional woodworker interested in getting started with hand planes, or for those who work mainly with dimensional lumber, you might still want the three fundamental bench planes – the no. 4, no. 5, and no. 7, but you won’t likely use them in the same manner as you would if preparing rough lumber from the mill. The point is, don’t avoid hand planes simply because you work with dimensional wood. Just understand that you’ll be using them differently than you would if you were preparing rough lumber. And don’t be ashamed of using dimensional wood if it’s more convenient or practical for your work space. It may not be the most economical way to go, but it’s better than missing the opportunity to work wood at all. 1. Christopher Schwarz, Coarse, Medium, and Fine.